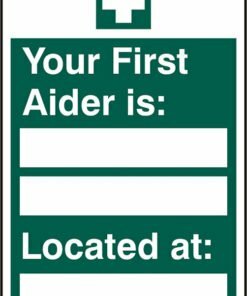 A selection of first aid signs that are essential for the workplace and for use in any public buildings such as schools, medical centres, care homes etc. Part of our range of quality safety signs. Choose from rigid PVC signs or self adhesive signs. All first aid signs are available in a pack of 5. Our first aid signage will help employees and visitors to locate where the first aid box is located and who the first aiders are in the building. This is essential in an emergency situation and could literally be the difference between life and death. In the event of an accident or injury, whether minor or more serious, it’s important that you are prepared. Therefore, providing adequate first aid signage is essential. Need any help with your online order? Call us on 0330 0885 675 and we’ll be very happy to assist you with your purchase.